Coming soon right here from the Koinup team! - a review of some the art from Burning Life 2009 - held from October 17th to 25th. Joining writing forces with Fiona Hayworth, Soror Nishi and myself Poid Mahovlich to bring you a unique and entertaining guide to what's out there on the virtual playa! Burning Life is the real-life counterpart of the Fire, Arts and Community festival known as Burning Man . 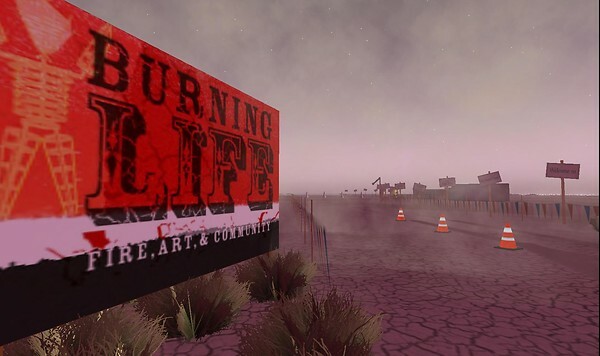 This is the 7th such event under the heading of Burning Life, which has both a very colourful & historical past. This year 34 mature marked Sims have been dedicated to this years event. they are buzzing with activity and the community is growing daily as the influx of burners expands - let's see where this takes us this time round, after all it's all about the art, the fire and the community! 'metanopsis' will also be in the thick of it interviewing a very fine selection of burners who are working away hard to show you a diverse selection of art from the virtual playa. Feel free to add your Burning Life images right here and show us through your eyes how you see this event. Gates open at Burning Life on October 17th as we will kick off right then and there! See you guys on the playa!